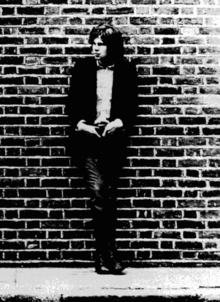 Nick Drake (19 June 1948 – 25 November 1974) was an English singer-songwriter. He was best-known for his acoustic guitar songs. He was not popular with a wide audience while he was alive, but his work has now gained recognition. He was born to British parents in Yangon, Burma. He has an older sister Gabrielle Drake who is an actress. He released his first album Five Leaves Left in 1969. He then released two more albums: Bryter Layter (1971) and Pink Moon (1972). On 25 November 1974, at the age of 26, Drake died from an overdose of approximately 30 antidepressant pills. His cause of death was determined to be suicide. ↑ Richie Unterberger. "Nick Drake". AllMusic. Retrieved 5 May 2016. Wikimedia Commons has media related to Nick Drake.